Abraham Anghik Ruben is a contemporary artist of Inuvialuit ancestry. His work is unique in how it embodies his cultural heritage within the nuances of his contemporary world. As a sculptor, Ruben’s work is unparalleled in Canada in scale and eloquence in communicating his artistic message: an interpretation focused on the oral tradition of stories, myths and legends that were shared with him by his parents and elders from Paulatuk. 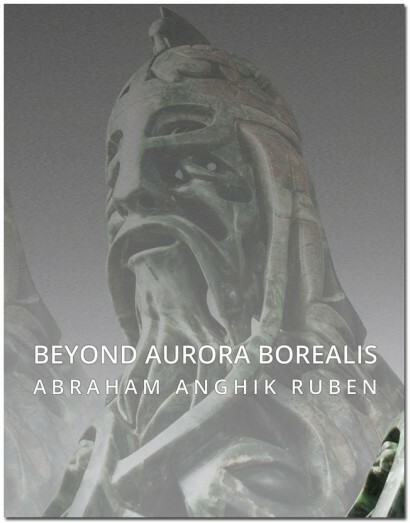 Ruben’s search into the past for an authentic Inuit identity has led him to the inevitable encounter with the Viking Norse and native inhabitants of Iceland and Greenland; an element that has had a profound influence on his work and inspired the domino effect of sculptures that have changed the landscape of Inuit and Canadian art. Hence his adamant and compelling insistence to be recognized as a legitimate, Canadian contemporary artist, of Inuit ancestry. An appellative that the Canadian art world has to reconcile and move away from is the fossilized premises that people from the North, artistically speaking, can only envisage hunters, marine mammals such as narwhal, walrus and seal, arctic birds and or conventional portrayals of Inuit women with children in parks. This exhibition consists of twenty four sculptures dating from 2009 to 2015. (2009 plate # 2, 5 and 20) I have selected works from the Kipling Gallery Collection as well as from private and corporate collectors. When viewing these works the viewer can appreciate and experience the complexity of each composition and the artistic dexterity required to render the intricacies and nuances of the art work (plate 5). Abraham is an artist constantly challenging himself to further develop his special techniques to create even more interesting compositions. His quest explores new ways to interpret the many stories, myths and legends of the past by; pushing the boundaries of his compositions with shapes and sizes that illustrate a sophisticated understanding of engineering and visual effect. This is evident in Ancient Evenings Under the Northern Lights (plate13) and Odin Under the Northern Lights (plate 9). In these two works, Abraham has incorporated metal rods in order to give the stone the required structural integrity to create the composition that he envisioned. The artist constantly faces the challenges of finding new ways to interpret the ideas that become a revolving door in his mind and thus become very intimate and personal. And this intimate and personal approach in his art finds common ground in the stone presentation. For this exhibition Abraham has pushed the envelope to new heights, creating two masterful works specifically for this exhibition: The Tree of Life (plate 16, 152.0 cm x 242.0 cm, or 5’ by 8’) constructed of multiple pieces of stone, and Sigurd the Dragon Slayer (152.0 cm x 91.5 cm., or 5’ by 3’). Both of these works are designed as wall pieces, as Abraham has defined them. These are two of three bas-reliefs presented in this exhibition, and they are an indication that he enjoys the freedom to express himself through his craft and always moving in a forward direction without any hesitation or inhibition of his interpretation. Talented and open to explore the intricacies of sculpting, Abraham sometimes relies on the formal training he received at the University of Alaska, Fairbanks, to convey his ideas first through preliminary sketches and drawings and then execute them, as it is the case with this series of bas-reliefs. In fact, this is the first exhibition catalogue in which one of his working drawings will be published; and hence we kindly apologize for not having the completed bas-relief published simply because it was not ready to be photographed in time for the publication deadline. The decision to publish Abraham’s working drawings is intended to dispel any misunderstanding by acknowledging his formal training and to confirm that great art does not materialize out of nowhere. Out of nothing, nothing will come (Ex nihilo nihil fit), so runs the Latin adage, and I can firmly attest that this artist’s accomplishments are the fruits of his intensive and unrelenting love for his art and his calling. I would like to thank Alysa Procida, Brittany Hollis, Lindsay Bontoft, and Lauren Williams from the Museum of Inuit Art for hosting this exhibition. I would also like to extend my genuine appreciation to the collectors for sharing their sculptures. The Webster dictionary defines beyond, in a degree or amount of surpassing; something that is beyond; something that lies outside the scope of ordinary experience. Most of all I would like to thank Abraham for his dedication, strength, inspiration and creativity. These contemporary masterpieces will endure in time for generations to come! Lou Ruffolo and I, as co-owners of Kipling Gallery, would like to express our heartfelt gratitude to Abraham for his commitment to his work.